When a 20-year veteran agent for Medicare supplemental insurance plans reinvented her company, requirements included a new company name, logo, vision statement, website, and comprehensive marketing strategy — all designed within the confines of Medicare’s rules of compliance. After a deep dive into the mindset of the market, and a meeting of the minds on corporate vision and values, we developed a strategy based on strengths of the founder’s long and highly successful career and expansive personality to develop a set of assets that would set the company apart from competitors. We took the client through a detailed process of naming before choosing the classic apple as the core symbol for healthy lifestyles. 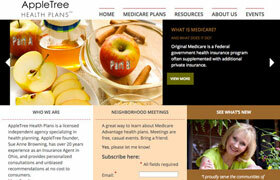 Apple Tree Health Plans has, as its tagline, “Healthful Medicare planning year after year” supports the company’s customer loyalty goals. Website and marketing material content were approved by compliance on the first pass, a testament to extensive research in advance of content writing and design. « Law Offices of Marc R. Gaylord, P.A. « The Stewardship Foundation, Inc.